On this day, at this exact hour, on the 2nd of May, 16 years ago, my Family and I were in that long line, leaving Kosovo as refugees. We didn’t know if we’d still be alive until we get to Albania (as a recuing country during the war of 1999). I could even remember the faces of our friends as we were leaving, and no one knew if we ever gone see each other again! As a young pianist and a singer at that time, I somehow had a song that I was singing to myself during all those days of war!! After we managed to escape safely to Albania, we came back to Kosovo as soon as the war ended, just to find so many changes which would influence all our future lives…I found out that a famous singer from Kosovo was killed. It was the singer who sang the song “Ma fal at buz’qeshje” (Give me that smile, a composition from a Kosovo female composer Pranvera Badivuku) a song which accompanied me during the war times!!!!! Exactly at this moment I was more than sure that one day I would do something to bring this big miss fortune in attention to the world, of course as 11 years old it didn’t came to me the idea of producing a CD, since at that time I had only one CD with J. S. Bach fugues and partitas which my uncle had sent it to me from Germany. Well, I didn’t used it at all because we didn’t have a CD player. On 2013, when the opportunity appeared I decided that I want to record a CD with Albanian Music (from Albania and Kosovo), with those songs that my great-grandparents, grandparents, parents and me grew up! My big intention was this CD to be an International CD, so that the people around the world would have a chance to listen and learn from this ”incognito” culture. 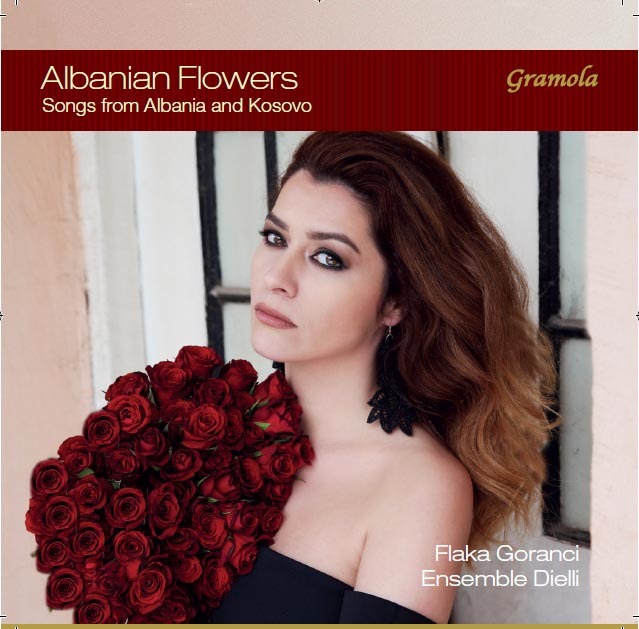 After two and a half years of work, which were not easy at all we finally framed our International CD “Albanian flowers” with a producer “Gramola” Company located here in Vienna. (The CD will be released from 12 of May 2015 in Austria and from July in the International market). The CD includes Albanian songs rearranged in a lyrical classical style keeping the original vocal line intact! The CD includes also a Booklet. The Booklet contains the lyrics of the songs translated into German and English language, as well as photos from the most beautiful parts of Albania and Kosovo that are combined with the lyrics of the songs! This is the reason why the project was called “Guide through music”, at the beginning. If you wonder if the song “Ma fal at buz’qeshje” is included in this CD, I can proudly say YES! It will be sung as an A Cappella song, same as once, “at those times” was sung. This comes In Memoriam of the famous singer Esat Bicurri, who was executed during the war. Hence, I would like to dedicate this song to Bicurri and to all the other artists who lost their lives during this war time! I do believe that music brings people together, brings joy and Happiness between human beings. I dedicate this CD to my Family, Friends, Relatives, Colleagues and to my Mentors who were there for me during all these years. I am also thankful to all the people who supported and believed in this Project! Ministry of Culture in Kosovo, Ministry of Culture in Albania, Ministry of Diaspora in Kosovo, Cultural Heritage without Borders in Kosovo, Foreign Ministry of Austria, Integration Ministry of Austria, Embassy of Austria in Prishtina, Embassy of Kosovo in Vienna, Municipality of Gjakova and Bank Austria in Austria. Kushtrim Gashi, Mennan Bërveniku, Edison Pashko and Adela Frasineanu for your amazing cooperation! Christian Heindl for a very original description of the music from Albania and Kosovo. Photographers: Alket Islami , Arben Llapashtica, Artan Korenica , Bardh Sokoli,Nëntor Oseku , Peter Rauchecker and Shkelzen Rexha.